Toshihiko Tsuchiya, partner in Orrick's Tokyo office, is a member of the Real Estate Group. His practice focuses on the securitization and liquidation of real estate assets, including the utilization of the TMK structure in development projects. His experience covers not only real estate assets, but also receivables and claimable assets. Mr. Tsuchiya has also been involved in a wide range of international and domestic business transactions including mergers and acquisitions, general corporate matters, international litigation and international arbitration. Before joining Orrick, Mr. Tsuchiya was a partner at Jones Day and a Japanese law firm in Tokyo. James Atkin is the global head of Orrick’s Oil & Gas practice. Widely recognized as a leading energy lawyer in Tokyo and Band 1 ranked by Chambers Global, James focuses his practice on helping companies with their international energy investments. He advises clients in the oil and gas sector on transactions in Asia, Australia, the Middle East, Africa and North America, and has extensive experience advising on large-scale oil and gas projects, LNG sales arrangements, and energy-related mergers and acquisitions. Yuko Ino is a partner in Orrick’s Tokyo office. She regularly counsels domestic, regional and international funds in sophisticated real estate transactions including acquisitions and dispositions, construction and development projects, financings, fund formation, joint ventures, and restructurings and workouts. Yuko also handles various aspects of cross-border and domestic business transactions including energy projects, fintech related projects, licensing, mergers and acquisitions, international disputes, compliance matters, and general corporate matters. Before joining Orrick, she worked at Morrison & Foerster from 2006 to 2010. Previously, she worked at Yanagida & Partners (formerly known as Yanagida & Nomura), a Japanese law firm in Tokyo. Yumiko Ohta, partner in the Orrick's Tokyo office, is a member of the Employment Law Group. Yumiko focuses mainly on employment law advice as well as various corporate transactions including compliance, corporate governance, mergers and acquisitions, joint ventures, litigation and general corporate transactions. Yumiko also has international trade expertise in areas such as customs rules and export controls. Before joining Orrick, Yumiko was an associate at Tanabe & Partners and advised clients in corporate transactions and employment law as well as represented clients in civil and family cases. Also, she has experience serving as an outside auditor for Japanese corporations. Prior to practicing law, she worked at Mitsubishi Corporation for seven years. While there, she was involved in LNG projects and other global business. John Inge is counsel in the Intellectual Property Group and resident in the Tokyo office. He has more than 30 years of patent and other intellectual property law experience divided between Japan and the United States. John has experience handling matters involving a wide range of technologies, including semiconductor devices, consumer electronics, communications systems, computers and associated equipment, radar, optics (including fiber optics), medical and surgical devices, display systems, lighting devices, printing systems, electronic photography, energy storage devices and plastic molding technology. John's legal practice spans patent litigation, interferences, validity and infringement investigations, and negotiations and licensing involving all aspects of intellectual property. Joint venture and research and development agreements in an international context are a particular area of his focus. He frequently counsels clients in both the United States and Japan on patent portfolio management and intellectual property strategies. John currently teaches a course on International Intellectual Property Strategy at Hitotsubashi University in Tokyo. He previously served on the adjunct faculty of George Mason University School of Law, teaching courses on interference practice and other advanced areas of U.S. PTO practice. He also taught international intellectual property law at Temple University Law School’s Tokyo campus. He also was the longest-serving chairman of the Board of Directors of Yokohama International School, one of the world’s oldest and most prestigious institutions of secondary international education, and he currently chairs the school’s Board of Trustees. John regularly lectures throughout the Pacific Rim on intellectual property law topics. He is also a frequent lecturer on U.S. patent practice at public and in-house seminars in Japan. Yuko is a member of the Energy and Infrastructure Group. Her practice mainly focuses on M&A, project financing, and permits and authorizations of renewable energy projects. She also handles real estate transactions, environmental conservation and fintech matters. Before joining Orrick, Yuko was an associate at the Tokyo office of s Japanese law firm. Previously, she worked in the Malaysian office of BirdLife International, an international environmental NGO. She also worked for the Japan Bank for International Cooperation, where she was involved in environmental and social compliance matters with relation to yen-denominated loan projects. Yuko is a member of the environmental preservation committees of the Japan Federation of Bar Associations. Reiko Saito, a senior associate in the Tokyo office, is a member of the Energy and Infrastructure Group. Reiko's practice focuses on advising clients on cross-border energy and infrastructure projects and corporate transactions such as mergers and acquisitions, restructuring and compliance matters. Reiko also practices financing transactions such as liquidation of various receivables and real properties and development of financial products including structured finance and trust products. She has extensive experience of general real estate securitizations, consumer loan securitizations and other ABS transactions. Before joining Orrick, Reiko was an associate at Atsumi & Partners from 2001 until 2006, where she was engaged in many securitization and liquidation projects. Kane Huang, a senior associate in Orrick's Tokyo office, is a member of the M&A and Private Equity Group. Kane advises U.S. and Japanese companies on cross-border M&A, joint venture, technology licensing, energy and real estate related transactions, as well as compliance, corporate governance, and general corporate matters. In addition to transactions between U.S. and Japanese companies, Kane works on a variety of multijurisdictional transactions involving entities and assets in Asia and Europe. Kane worked at Orrick's Silicon Valley office from 2010 to 2012, where he focused on technology sector M&A. Sakon Kuramoto is a managing associate in Orrick's Tokyo office and a member of the M&A and Private Equity Group. Sakon has used his experience residing in the United States and Singapore to provide practical advice to emerging and established companies on a wide range of matters involving domestic and cross-border investment/M&A, compliance, finance, venture capital transactions, dispute matters and crisis management. His comments have often been introduced in legal articles of the Nikkei Newspaper, a high prestigious business paper in Japan. He received the 6th Shinnippon-Hoki Inc. Foundation Incentive Award (Award of Excellence). He is one of the Candidates for Advisory Panel Membership in the Grievance Mechanism for the Tokyo 2020 Sustainable Sourcing Code. He also has extensive experience in finance and day-to-day legal matters, giving practical advice to emerging companies which are engaged in AI, IoT, Fintec and tourism businesses including vacation rental business. Additionally, he has been responding to the needs of Japanese companies advancing overseas by giving advice on the establishment of a corporate governance structure, the enhancement of global compliance system and ESG related legal matters. He is familiar with various countries' regulations aiming to rectify supply chains, international rules and standards regarding corporate governance/CSR including “Business and Human Rights” issues and related ILO Conventions. He is familiar with the ESG investment such as green bond and social bond. Haruka Matsumoto is a senior associate and member of the Complex Litigation and Dispute Resolution Group in the Tokyo office. Haruka focuses on civil and commercial disputes, compliance, labor and employment, and antitrust related matters, in addition to insurance and insolvency for both domestic and non-Japanese companies. She also participates in the publication of reports on Japanese and foreign employment and labor laws. Prior to joining Orrick’s Tokyo office, Haruka was an associate at Nagasawa Law Offices. Kentaro’s practice focuses on the development and financing of various energy projects, representing domestic and international sponsors and developers. He mainly works on project contracts, including EPC, BOP and O&M contracts. He acquired of great understanding of clients’ needs after a secondment at a Japanese major trading house in 2013 and 2014. Prior to joining Orrick’s Tokyo Office, Kentaro worked in the Tokyo office of another international law firm where he engaged in cross-border M&A, finance transactions and dispute resolution. Masao Fujino is a specialist of Japanese patent, trade secret, privacy and antitrust laws. Masao provides Japanese patent, trade secret, privacy and antitrust law advice to companies thinking about and doing business in Japan. He prepares privacy policies and terms and conditions for companies entering to the Japanese market and also provides contract analysis from the perspective of Japanese antitrust law. He is also familiar with dispute resolution procedures including Japanese court proceedings especially related to patents and trade secrets. He especially provides advice to companies in the IT and mechanical industries. Prior to becoming a lawyer, he was an engineer in a Japanese IT company. While he was a legal trainee after passing the Japanese bar examination, he studied at the Japanese space agency, Japan Aerospace Exploration Agency, and the IP division of the Tokyo District Court. He also studied at Stanford Law School as a Fulbright scholar (US government scholarship). Yusuke Kobayashi is an associate in Orrick's Tokyo Office and a member of the Employment Law Group. Yusuke mainly focuses on employment law advice, as well as various corporate transactions including compliance, corporate governance, mergers and acquisitions, litigation and general corporate transactions. Anri Nakamoto is a managing associate in Orrick's Tokyo office and a member of the Intellectual Property Group. His practice focuses on representing clients in patent litigation, trade secret litigation and other intellectual property disputes. Anri also counsels clients on patent portfolio management, intellectual property strategy developments, adversarial patent licensing negotiations, and other IP related matters in cross-border M&A and strategic business and technology alliances. Prior to joining Orrick, Anri worked for more than 10 years at Hitachi Ltd., Panasonic Corp., and IP Bridge Inc.
Haru Kishino is an associate in Orrick's Tokyo Office and a member of the Real Estate Group. His practice focuses on domestic and overseas financial institutions, real estate funds, real estate developers and other companies. He works mainly on transactions involving special purpose companies and finance related transactions with SPC and Trust schemes. He also gives legal advice on international corporate trades, finance related transactions, real estate related transactions and general corporate matters. Hitoshi Fujisaki is an associate the Tokyo office and a member of the Real Estate Group. Mark Weeks is a partner of the M&A and Private Equity Group, splitting his time between Hong Kong and Tokyo. He practiced in New York and Tokyo for more than 25 years. Before relocating to Hong Kong, Mark served as office leader of Orrick’s Tokyo office from 2006 to 2017. He concentrates his practice on mergers and acquisitions, joint ventures, clean technology, life sciences, IT and telecommunications asset transfers, strategic investments, and general corporate representation for U.S., Japanese and other Asian companies. Mark speaks, reads and writes fluent Japanese. Hiroshi Sarumida is a partner in the Global Mergers & Acquisitions practice of Orrick’s New York office, and also the U.S. Chair of the firm’s Global Japan Transactional Practice. Hiroshi has 25 years of experience advising on a broad range of corporate transactions, especially representing Japanese multinational corporations in matters involving cross-border mergers and acquisitions, international joint ventures, corporate restructuring transactions, international corporate finance transactions, U.S. and transnational litigations and other dispute matters, and crisis management. For nearly three decades, Robert Benson has dedicated himself to helping clients resolve their most challenging legal disputes. Whether litigating multi-patent matters, competitor disputes, or licensing obligations, Robert blends his commitment to serving others with his legal acumen, creativity, integrity, and collaborative leadership to attain the best possible results for his clients. Robert has handled a wide range of commercial and intellectual property litigation in federal and state courts, has obtained injunctive relief, litigated Section 337 investigations before the ITC, and argued before the Federal Circuit. He has handled both offensive and defensive patent licensing and litigation, and has implement strategies that incorporate inter partes review, reexamination, and other PTO proceedings. His matters have involved technologies including semiconductors, graphics processing, mobile devices, computer hardware and software, medical devices, and countless other products and consumer electronics. In addition to his domestic practice, Robert also leads Orrick’s Taipei office. In Chambers Global 2018, Robert is the only attorney ranked in the U.S. for Intellectual Property – Foreign Expert for Taiwan. Global corporations headquartered in Asia trust him to navigate the unique issues, claims, and defenses that arise in multinational litigation and cross-border disputes. Please click here to read his bio in Simplified Chinese. Robert’s commitment to service extends beyond his professional clients. Over the past 20 years, Robert has established programs in Asia, Africa, and North and South America that care for hundreds of at-risk children and enable them to attend universities and launch their careers. He is the founder of Arms of Love International, a charitable organization that operates family-based homes for abandoned or abused children, and Love Forward, a charitable organization that provides a higher education for students who have experienced violence and other forms of abuse. In his recently published book, Love Forward, Robert shares the life stories of some of the young women and men who grew up in the Arms of Love homes, together with his personal story, to encourage and inspire others in their own endeavors. In recognition of his service, Orrick awarded Robert its Community Responsibility Award in 2017. Peter Bicks is a nationally recognized trial lawyer based in New York. Clients repeatedly turn to Peter for their most challenging, high-profile business disputes -- ranging from intellectual property to mass tort claims. Over the course of his career, he has proven he can win at trial in any forum, ranging from state court juries in Alabama, California, New York, Texas, Utah, and West Virginia to the International Trade Commission. Peter’s versatility is one of his hallmarks. To each case, he brings a combination of deft courtroom skills, strategic acuity and team leadership. The results have included a triumph in a bi-coastal battle for Dish Networks against the major television networks, fending off a multibillion-dollar lawsuit for Union Carbide in a hostile Texas courtroom against one of the nation’s winningest plaintiff’s lawyers, and protecting Nintendo’s popular Wii video gaming system before the ITC. Peter defended DISH Network in a high-profile trial in Illinois where the FTC and various state attorneys general sought more than $700 billion in damages and penalties for alleged telemarketing violations, limiting recovery to less than one percent of that amount. Peter also represents Oracle in its high-stakes copyright infringement litigation against Google, currently on appeal, in which The Recorder proclaimed after his opening statement: “Oracle’s New Lawyer Comes out Swinging.” Additional examples of his opening statements, voir dires, cross-examination and closing statements, including accompanying graphics, can be found in the Engagements section below. 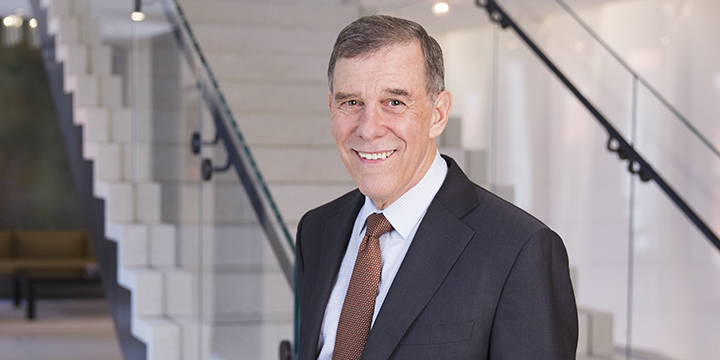 Peter serves as a member of Orrick’s Board. Before joining Orrick, Peter was a partner at Donovan Leisure. He captained his college tennis team to a national ranking, has successfully competed in major national sailboat competitions, and serves on the Board of the Harlem Junior Tennis and Education Program. With his wife Linda, he has three children: Avery, Isabelle and Phoebe. Joseph A. Calvaruso is a partner in the Intellectual Property group in the New York office. Joe, a veteran intellectual property law specialist focusing on patent litigation, has extensive experience at the trial and appellate levels. Joe also has litigated cases involving trademarks, trade secrets, false advertising, antitrust and unfair competition. In addition, Joe has extensive experience as lead counsel in Inter Partes Reviews before the Patent Trial and Appeal Board of the U.S. Patent & Trademark Office. Known for his candid approach and formidable courtroom style, Joe has the trust of his clients and the respect of the bench. As a veteran patent litigator, he can distill complicated facts into precise strategies that often resolve matters by summary judgement, saving his clients valuable time and expense. As one client put it, "Joe Calvaruso is exceptional, his work has been truly excellent." (Legal 500) Another client offered: "He's like a defenseman on a hockey team or an NFL linebacker - tough as nails. But he's always fair and a good person on your side to or go up against. He just gets the technology as well." (IAM 1000) Intellectual Asset Management ("IAM") rates Joe as a "practical commercial lawyer, he has talent for resolving disputes early, together with the courtroom skills to prevail at trial...."
Joe’s diverse experience includes consumer electronics, computer hardware and software, optical equipment, medical devices, semiconductor devices and fabrication, and financial services. His demonstrated ability to translate complicated topics to judges and juries is a valuable asset particularly appreciated by his international clients. Joe uses the same clear and practical approach to help non-English speakers understand intricate legal issues. Nick has been involved on major operations such as the construction of the world’s largest dam, Inga 3, in the Democratic Republic of Congo, a $500 million 144A/Regulation S bond issuance for Millicom International Cellular S.A., a leading telecommunication operator in emerging markets, and the financing by the Agence Française de Développement for a 5.9 MW photovoltaic plant in Benin. Before joining Orrick, Nick spent 16 years working at another international law firm. He is admitted to the Paris Bar as a Solicitor of England and Wales. Alex advises clients on cross-border project financings with an emphasis on project and trade finance. Alex represents lenders, multi-lateral lenders, development finance institutions and borrowers doing business in emerging markets, particularly Sub-Saharan Africa. With over 20 years' experience, Alex provides clear, commercial advice on complex issues to clients operating in the power and infrastructure sectors. He has extensive experience in the infrastructure and energy sectors (particularly oil, gas and renewable energy). Alex has been recognised in Legal 500 in the categories of infrastructure, power and most recently as a leading practitioner in emerging markets. He is ideally placed to advise on transactions involving multi-lateral lenders having served a secondment to the Office of the General Counsel of the European Bank for Reconstruction and Development. Whether handling an ITC trial, or serving as Co-Chair of the firm’s Intellectual Property group, Sten Jensen brings exceptional focus and precise execution to his work. Sten routinely guides clients such as FUJIFILM and Panasonic through the minefields of the ITC. Sten also has long-standing relationships with attorneys in the ITC’s Office of Unfair Import Investigations, developed when he served on the Executive Committee of the ITC Trial Lawyers' Association. Sten’s credibility with this group, combined with his thorough knowledge of the ITC’s speed and complexity, gives his clients a distinct advantage. Sten has also represented clients in more than 50 federal patent cases, including cases in the top five venues for patent infringement filings. He has particular expertise in Delaware, where he served as a judicial clerk for former District Court Judge Roderick McKelvie. Sten has defended numerous corporations against claims filed by aggressive patent trolls, and his cases have protected a wide range of technologies, including integrated circuits, semiconductors, optical disk drives, digital cameras, printers, and other consumer electronics products. Sten has frequently lectured on intellectual property issues facing companies in the United States, Japan, and Taiwan. He is widely praised by clients for his dedication, knowledge, and skill in guiding them through discovery, merits, and settlement issues. Jeffrey Johnson resolves complex commercial and IP litigation for the high-tech, energy and life science industries. Jeffrey earned his reputation as a first class litigator in the Eastern District of Texas, one of the nation’s toughest jurisdictions. Known for extricating clients out of multi-faceted litigation with creative settlements, he now represents clients throughout the country and in Asia. Jeffrey manages all aspects of litigation from discovery to arguing motions and Markman hearings to trial. He has also been Lead counsel on both IPR and CBM actions and argued IPR hearings. Jeffrey’s diverse experience allows him to efficiently and effectively manage all types of cases. Depending on each client’s specific business objective, he can compose a lean team to quickly resolve a minor matter, or lead a massive joint defense group across multiple jurisdictions. Konstantin Kroll is a leading M&A and capital markets (debt and equity) expert, recognised on numerous occasions by Legal 500, IFLR, Chambers and Best Lawyers. Dual qualified in Russia and England and Wales, he has over 20 years of experience advising corporate clients and financial institutions on complex cross-border transactions in Russia and the broader region of the former USSR. Konstantin is the Head of Russia & CIS Desk in Orrick London office. Konstantin’s practice concentrates on M&A, joint ventures, debt and equity capital markets transactions, structured finance and derivatives. He also has significant experience in project finance, bankruptcies and restructurings. Konstantin has advised clients on some of the largest M&A transactions in the energy, manufacturing, consumer and banking sectors in the Russian market. Konstantin is an accredited arbitrator at the Russian Arbitration Center at the Russian Institute of Modern Arbitration (RIMA). Most recently he has represented Zarubezhneft, a major Russian state owned oil and gas company, in connection with the acquisition of a stake in the Kharyaga Production Sharing Agreement (one of only three of a kind in Russia) and the transfer of operatorship from Total. Prior to joining Orrick, Konstantin was a partner at Jones Day and before that at Allen & Overy where he led the firm’s debt capital markets and derivatives practices in Russia. Yufeng (Ethan) Ma, a partner and the chief representative in Orrick’s Shanghai office, has over 15 years of experience assisting clients in intellectual property (IP) related matters including IP litigation before the US International Trade Commission (ITC) and the federal courts. In addition to specializing in complex IP litigation relating to patent infringement, ITC 337 investigations, trade secrets misappropriation and unfair competition, Ethan has extensive experience advising clients on IP administrative disputes and reexamination, IP strategies, IP due diligence, and IP aspects of strategic transactions, including licensing or transfer, mergers and acquisitions, joint ventures and collaborations. His clients cover a wide range of industries, including hardwares, softwares, internet, semiconductors, electronics, telecommunications, AI, automobile, chemical, materials, energy and medical devices. Ethan has represented dozens of Chinese companies in resolving their IP disputes in the US over the years, and earned client’s long-term trust. During his years in private practice, Ethan and his litigation teams won a number of high-profile ITC investigations involving Chinese companies. In one investigation, his clients are four subsidiaries of a large state-owned company of China, who were sued for patent infringement. The Commission reversed the late Chief Administrative Law Judge’s unfavorable decision and found that Ethan’s clients were not infringing and did not violate Section 337. In another investigation, he represented the complainant and its subsidiaries in China suing a group of Chinese respondents for trade secret misappropriation. The ITC issued a 10-year exclusion order against these respondents. This landmark decision represents a new development of trade secret law and ITC jurisdiction in the US, and was upheld by the US Court of Appeals for the Federal Circuit. Prior to joining Orrick, Ethan served as Director of IP, Asia of a world leader in specialty glass and ceramics, where he was in charge of the company’s daily IP matters in China and throughout Asia. Before that, he was a partner and member of the Board at McAndrews, Held & Malloy in Chicago, Illinois. Ethan was the first non-US born lawyer of that firm. John MacKerron, a lawyer in the New York office, is a member of the Structured Finance Group. The focus of his practice is in securitization transactions and derivative financial products, with an emphasis on acting as counsel to the sponsors of, and other participants in, various municipal bonds repackaging programs. A partner in the firm for 20 years, John served in various capacities on the firm's leadership team during that time, including two terms as a member of the Executive Committee. Rich Martinelli develops comprehensive IP strategies which resolve immediate legal needs and safeguard long-term business objectives. He handles all aspects of intellectual property, particularly patent litigation, patent prosecution and client counseling. He has litigated patents at trial, before the ITC, and on appeal to the U.S. Court of Appeals for the Federal Circuit. Rich has counseled clients and rendered opinions on patent validity, infringement and freedom to use. In addition, he is a registered patent attorney with experience drafting patents and practicing before the U.S. Patent and Trademark Office. Rich’s patent work has involved a wide range of technologies including image processing, 3d graphics, audio / video compression, computer hardware and software, e-commerce, network technologies, digital rights management and encryption. Dan has over 30 years of experience and manages a leading practice in project development, asset acquisitions and financings in the energy and infrastructure sectors. He is Global Co-Head of Infrastructure and serves on Orrick’s Board of Directors. Dan advises clients on Public-Private Partnerships and large-scale, complex project financings. His key clients include major strategic and financial sponsors who have been involved in many of the largest and highest profile PPP and project development transactions over the past 20 years. Dan leads a team that has the depth and breadth to deliver excellence in every phase of a project, including development, construction, financing and operations, as well as providing leading M&A, restructuring and tax advice. Dan advises on projects spanning the infrastructure space, including toll roads, rail, airports, ports, thermal and renewable energy generation, transmission infrastructure, telecommunications infrastructure, and water and waste facilities. Mike McAndrews is a partner in Orrick’s Real Estate Group based in Los Angeles. He represents real estate investment funds, banks, other financial institutions, developers and corporate clients in investment, financing, acquisition and disposition and corporate real estate activities. Experienced litigator Denise Mingrone enforces and protect clients’ technology rights. She approaches each challenge on multiple fronts so as to achieve success whether it be in or out of court. No stranger to the courtroom and having handled complex litigations for technology giants including Synopsys, Brocade, Applied Materials and Oracle, Denise seamlessly and efficiently manages large teams to secure victory. Clients appreciate her transparent collaboration and instinct for developing a strategy that ensures that only the “right” evidence is presented to the trier of fact. The jury verdict Denise’s team obtained in the Netgear v. Ruckus Wireless patent trial, for example, surprised most because the team took over the case just weeks before jury selection, earning the number one place on that week’s “Top Jury Verdicts.” Prior to the Ruckus trial, Denise’s team similarly received accolades as “Top Verdict of the Year” for its jury win on behalf of Brocade against A10 Networks involving patent and copyright infringement. These victories were preceded by a trade secret win for MGA in the “Barbie v. Bratz” epic battle against Mattel, which earned Denise the “California Lawyer of the Year” award for her contributions. In addition, Ms. Mingrone has led numerous software piracy matters, obtaining full relief in all such litigations which have reached resolution. Her work in this area encompasses both confidential as well as public investigations, all designed to assist clients in securing the protection of their intellectual property rights and ensuring they receive appropriate relief when those rights have been infringed. William Molinski is Managing Partner of the Los Angeles office and a member of the Complex Litigation & Dispute Resolution Group. An experienced trial lawyer, Bill has represented corporate clients and individuals in a wide variety of commercial disputes with a particular emphasis in the areas of trade secrets, and other intellectual property disputes, consumer class actions and real estate disputes. Bill routinely handles complex cases that can have a significant impact on a company's reputation and survival. His clients include major players in the technology, financial services and energy sectors as well as the entertainment and pharmaceutical industries. Bill was recognized in the 2016 edition of The Legal 500 for his work defending DISH Networks against copyright and breach of contract claims brought by four broadcast networks, a win that led to Orrick's recognition as "Litigation Department of the Year" by The Recorder. He was named a "California Lawyer of the Year" in 2011 by California Lawyer magazine as a member of the team representing MGA Entertainment in its "stunning victory" against Mattel over the Bratz doll line, which the Daily Journal called a "top defense win" of 2011. Quinn Moss, Co-Head of the firm’s Private Investment Funds Practice Group and a corporate lawyer for more than 20 years, has extensive experience representing financial institutions in connection with a variety of financing transactions, as well as serving as corporate counsel. She represents public pension funds and other institutional investors in alternative investments, including private equity, mezzanine and hedge fund formation and co-investments. She has represented several of the most active public pension fund investors in private equity, either directly or through their captive vehicles managed by outside advisors, including the Washington State Investment Board, the Oregon Public Employees Retirement Fund, the New York Common Retirement Fund, New York City Retirement Systems, as well as other investors such as Investiture, Cigna Investments, Wafra Investments, the Knights of Columbus, and Caspian Private Equity, as well as the former Credit Suisse Customized Fund Investment Group. Anne O'Neill, a partner in the London office, is head of Orrick’s UK Real Estate Practice. Her practice focuses on commercial property work with particular emphasis on acquisitions, development and complex joint ventures. She is an expert in shopping centre development and management. Anne often advises on significant real estate development matters in the housing sector. Chambers UK ranks Anne as a leading individual for her expertise in the London social housing market and Legal 500 UK recognises her as a persuasive negotiator and notable practitioner with local authorities and registered providers. Legal 500 sources say Anne is "exceptionally sharp" and a "consummate persuasive negotiator". Clients describe Anne as "responsive and commercial" and able to "articulate complex issues simply and concisely" whilst "providing in-depth knowledge and understanding which ensures we get the best and most appropriate advice." Chambers UK sources say "she is an absolutely exemplary lawyer," who is "proactive and leads her team really well." Joseph Z. Perkins, a partner in Orrick's Silicon Valley office, is a member of the Technology Companies Group, which advises emerging companies and venture capital firms. Joseph focuses his practice on providing private venture financing and merger and acquisition services to Internet, high tech, and clean technology companies in the United States and Japan. Prior to receiving his Juris Doctor from Harvard Law School, Joseph spent four years as an officer of a company that provides language and travel services to Japanese travelers. Simon is a dual qualified, bilingual Energy and Infrastructure lawyer whose practice is focused on major projects and financings in Africa and emerging markets. Over the past 20 years, Simon has represented project finance clients, including major development banks, commercial lenders and sponsor groups in the power/renewable energy, mining, petrochemicals, oil and gas and transport/social infrastructure sectors. Prior to joining Orrick, Simon was a partner at two other international law firms, including one at which he served as co-head of the Northern Africa practice. George Rigo is an M&A lawyer, based in Orrick’s Paris office. Specializing in corporate law, he is devoted to advising European and Asian industrial groups and holding companies on their mergers, acquisitions and joint ventures, notably in the sectors of energy, food and car manufacturing, and services. George also has experience on acquisition finance and restructuring matters. George has a very strong expertise in the renewable energy sector, working alongside major players in the market and advising on key projects in France. George mainly advises on the financing and acquisition of windfarm and solar projects, lately he has counseled 123 Ventures, Impax, Nord LB and EOS Holding on different transactions. George’s extensive experience on cross-border transactions includes negotiating and drafting international contracts or commercial partnerships with an emphasis on litigation issues succeeding the implementation of such agreements. Recently, George has advised Biostime, a Chinese manufacturer of nutritional and baby care products, listed on the Hong Kong stock exchange, regarding the signature of an industrial and commercial cooperation agreement with a French dairy cooperative. Before joining Orrick, George was an associate with Watson, Farley & Williams. He previously worked for Fidal Peat International Paris and the Paris office of Proskauer Rose. Jörg Ritter, a partner in the Munich office, is a member of the Corporate Group. He focuses his practice on mergers and acquisitions, venture capital and private equity investments, corporate litigation, German and international tax law and bankruptcy law. Jörg represents clients in all types of corporate transactions and litigation, including international venture capital and private equity funds as well as a variety of family offices. Prior to joining Orrick, Jörg was a partner in the Munich office of an international U.S.-headquartered law firm. Mark Seneca, a Corporate partner in the Silicon Valley office, is a member of Orrick’s M&A and Private Equity Group as well as its Technology Companies Group. Mark has dedicated his legal career to the M&A specialty, with experience in all aspects of mergers and acquisitions transactions involving both public and private companies in domestic and cross-border deals. Mark has a particular focus on the technology sector, having led hundreds of buy-side and sell-side transactions involving prominent high-tech serial acquirers, unicorns and venture back companies. His sell-side work involves multiple acquisitions by Google, Facebook, Salesforce.com, VMware, Amazon, Microsoft, Intel, IBM, Adobe, Yahoo! and Twitter. These deals include his high profile work for Cruise Automation in its acquisition by General Motors, Nest Labs in its US$3.2 billion acquisition by Google, and Instagram in its US$1.0 billion acquisition by Facebook, which was ranked one of the top 10 largest valued private tech M&A deals in the U.S. in 2012. In an interview with Bloomberg Law for a “Rainmakers” episode, Mark provided a substantive analysis of the Instagram deal, including its industry precedent and influence (click here). On the buy-side, Mark has served as lead M&A counsel for top public company acquirers (Yelp, Google, Yahoo! and Intellisync) as well as private company serial acquirers (Stripe, Pinterest and Social Finance). When trade secret issues arise, Caroline knows how to protect a company’s brand, its IP, and its bottom line. Drawing upon her experience in investigations and IP & business litigation, Caroline is a trial lawyer who deftly balances public perception with fiscal and legal responsibility. Working closely with her clients to investigate potential fraud, theft of trade secrets, and misuse of funds, she seeks to resolve issues swiftly and ethically. When further action is needed, she is ready to advise clients on litigation, government reporting and crisis management; helping them manage risk, fight back, recover, and move on. In addition to her trade secrets work, she has helped clients facing investigations or charges by state and federal prosecutors, as well as civil enforcement proceedings from regulatory agencies, such as the SEC. She has successfully defended clients against allegations of Hobbs Act extortion, public corruption, fraud, as well as violations of the Foreign Corrupt Practices Act (FCPA) and the False Claims Act. She has also represented companies who have been the victims of cyber-attacks, and advised technology and financial organizations on incident readiness and response. Caroline maintains an active pro bono practice. She has drafted amicus briefs in cases pending before the U.S. Supreme Court and U.S. Circuit Courts of Appeals, worked on prisoner’s rights, domestic violence, and housing cases, and currently represents children in asylum proceedings in conjunction with Kids In Need of Defense (KIND). In 2013-14, Caroline was selected to serve in the Boston Bar Association’s Public Interest Leadership Program. In 2017, she was named an Up & Coming Lawyer by Massachusetts Lawyers Weekly. She currently serves as the co-chair of the Mentoring Committee for the BBA’s Diversity & Inclusion Section. Anna Spanò, a lawyer in the Milan office, is a member of the European Corporate, Energy and Antitrust Groups. Anna has extensive experience in merger and acquisition and corporate transactions, including joint ventures, acquisition agreements and general commercial contracts. Since the beginning of the liberalization of the market in Italy, she has also focused on the energy sector, with special emphasis on renewable energy. Anna has been advising several foreign and domestic clients in multiple transactions in the renewable energy field (notably, wind and photovoltaic projects), including: site developments, EPC contracts and other supply related agreements, and provides assistance to sponsors in project finance projects. She works in close cooperation with the Orrick’s European Alternative Energy Practice who works mainly in the renewable energy project financing market. Before joining the firm, Anna was a member of Studio Legale Tributario in Milan, a law firm associated with Ernst & Young International. Anna received the J.D. at the University La Sapienza in Rome and admitted to practice in Italy since 1993. Having tried 27 federal and state trials over the past 40 years, Mark Wine can charm any jury. A natural storyteller and affable teacher, Mark transforms complicated technology into compelling stories, and faceless corporations into engaging individuals. Mark applies the same friendly and confident style when leading his litigation teams, inspiring each person to strive for greatness, and thereby elevating the entire team. Mark serves as Deputy Chair of the Global Intellectual Property Business Unit. Given his lifelong passion for technology, Mark is a natural fit for intellectual property litigation. He tries patent, copyright, trademark and trade secret cases for Fortune 500 companies throughout California, as well as international clients in Asia and Europe. He handles all phases of discovery, prior art research, pretrial, jury and bench trial work, post-trial motions and appeals before the Fourth, Seventh, Eighth, Ninth and Federal Circuits, as well as Section 337 proceedings before the ITC. As lead defense counsel, Mark settled a five-patent matter for a European medical manufacturer, for approximately one-half of one percent of the original demand. Mark’s team invalidated two of the five asserted patents on summary judgment and successfully defended that outcome in the Federal Circuit. The case settled just before trial on the remaining issues. Mark has also defended one of the world's leading consumer electronics manufacturers in patent infringement litigation involving plasma screen displays. The case involved claims and counterclaims covering 16 patents and was settled favorably following an intensive discovery and claims construction battle.